Inspiring Ideas with artist Jeanne Winters: Birthday Contest!! To celebrate the fabulous month of July ... my birthday month :-) ... I am hosting a Giveaway/Contest!! I will give away this lovely 5x7 framed sentiment. It's a wonderful taupe/gray wood frame with silver fern imprints. 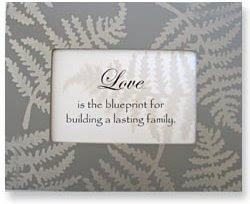 It reads "Love is the blueprint for building a lasting family." To be entered in the contest, please take a look around my blog and comment here about something you like! Post before midnight MT, July 10, 2008. I will draw one winner on July 11th and post the name shortly after. Be sure you leave your email in the comment so I can contact you for shipping information. Ships to US addresses only. Naturally, I will pay postage. Please spread the word. Thanks!! Happy Birthday in advance. Thank you for you wonderful comment on my MMM "Dance"
Your blog and artwork are very nice, Congratulations on working with Hallmark, can not wait to see what you have done there. Hope to see more from you on MMM, your "Places" piece is adorable, but you had great subject matter! Congratulations on all of your accomplishments. You have a true gift of encouraging and inspiring women all over the country. I like the Big Project!! Your new studio!!! I need to get started on mine! I love all the crafty pictures on your page. I also like your hair if that blond is you.Nice page,nice hair and nice giveaway. Well, you continue to make the rest of us look bad! :o) I am SO proud of you and all you've accomplished! Can't wait to see what you did for Hallmark! Keep us posted! I LOVE the spring wreath with baby birds! That is just too cute! Loved the pictures that you sent. AND love your website. I am always impressed (& envious!) of your incredible creativity and talent. Keep it up! I really like the picture b/w glass project. I'll need to file that one away. Happy, happy birthday! I just found your blog through Kelly's Favorite Things Swap. I took a fabulous break and browsed your blog. I must say I have a tender spot in my heart for Hallmark and KC. My mother's family is in Kansas City and my uncle worked there for many, MANY years in HR. Congratulations on such a wonderful opportunity! Can't wait for fall to walk into my local store and see your art!